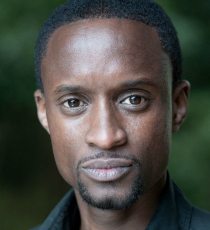 Peter Bankole is an actor who has featured in television shows such as Peaky Blinders, River, Death in Paradise and Clique. His film credits include Larrington in Danny and the Human Zoo, Mano Dayak in the Physician and Ezra in Red Faction. Peter has appeared on stage in Anthony and Cleopatra (Shakespeare’s Globe), Routes (Royal Court) and A Midsummer Night’s Dream (RSC). He is currently appearing in Barbershop Chronicles (National Theatre).